The brief, four-line song was written by a group of Joplin Junior College students and made its debut in 1939. Lee Elliff Pound, director of the Alumni Association, shares a bit about its history, while Dr. Rick Espinosa discusses updating the piece via a new arrangement for the athletic band. Check back next month for a unique perspective on the upcoming Korea Semester. They’re the customs we observe and pass down that remind us of who we are, and where we came from. The vocal music major from Lawrence, Kan., was one of two students selected to perform the song during the morning and afternoon ceremonies. GORDON: The whole selection is a pretty big deal throughout the Music Department. They take whoever is graduating and they have the individuals who would like to sing put their name on a ticket and then they have them come in. The head of the department, Dr. Talley, actually decides who gets to sing. Singing in front of I don’t know how many thousands of individuals for graduation, it was just incredible because I’ve never sang in front of anything that large before. HOST: As a music student, Gordon says he had an early introduction to the song. GORDON: As a freshman, I was part of the marching band, and with marching band we had to learn the alma mater and sing it at the end of every practice. It was part of integrating us as students as well as making us feel more prideful within Missouri Southern. As a musician, having something beyond just wearing the shirts and wearing the outfits, having a song to connect to – as a musician it really connected. 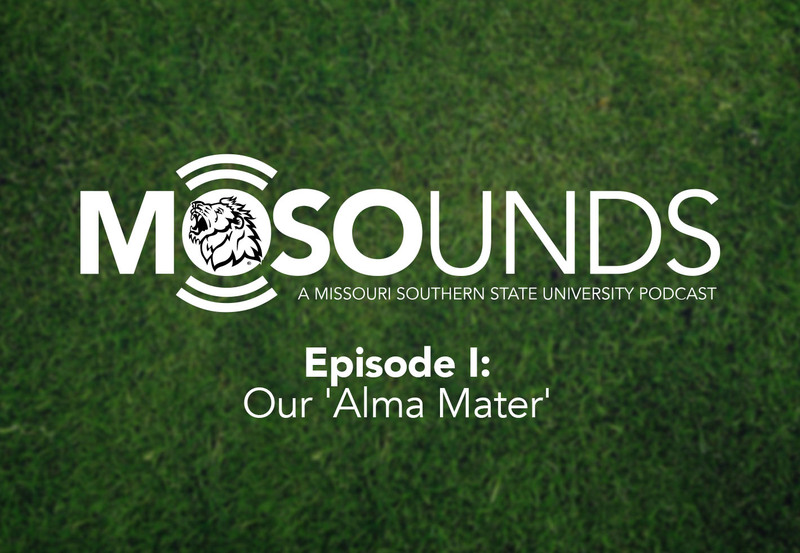 HOST: I’m Scott Meeker, with the University Relations & Marketing Department at Missouri Southern State University, and you’re listening to the first episode of MOSOunds – a new monthly podcast that will share stories of the people and history that make our university so special. This month, we’re looking at the Alma Mater – a brief piece of music that is nearly as old as the school itself. HOST: Founded in 1937, Joplin Junior College filled a critical need for area higher education. The first class of the two-year school established a number of traditions still held dear today at Missouri Southern, such as the selection of the lion as the school mascot and establishing the student newspaper known as The Chart. Lee Elliff Pound, director of the Alumni Association at Missouri Southern, said the piece was composed by a group of students who were among the leaders in the class of ’39. LEE: The Joplin Junior College Alma Mater was drafted during the school’s second year and it was by a group of alums. Those alums, you’ll hear their names quite often … it’s Mary Laird, Joan Epperson, Enos Curry, Ellen Beasley and Emerson Jackson. Mary Laird was principally responsible for the lyrics, and Emmerson Jackson was the one that set it to music. HOST: The first public performance of the Alma Mater came during a celebration called Class Day in 1939. Nearly eight decades later, the performance of the song continues to be an important tradition during commencement ceremonies. LEE: What they do is they select a senior to sing, and they sing it the first time through and then they ask everyone to stand and sing along whether you’re an alum, a friend or a family member. HOST: Interesting sidenote … Two of the JJC alums who penned the “Alma Mater” are also responsible for the school colors we still use today. LEE: Joan Epperson and Mary Laird, they were very close friends. Joan was from Neosho and Mary was from Joplin. What they did was they selected one of the two colors from Joplin – that’s where the green came from – and one of the two colors from Neosho, which was gold. Before you knew it, the newspapers were referring to our football team as the Green & Gold. HOST: While the stately version performed by Gordon Blodgett during commencement may be the one most are familiar with, Dr. Rick Espinosa – Missouri Southern’s director of bands – created a new arrangement of the piece last year. RICK: It’s a great alma mater. It’s four lines long and the chord structure is very easy to work with. I discovered during my first and second year here playing it in an athletic band setting that it seems to want two different versions. While the concert version works wonderfully for graduation and for ceremonies such as that, when we performed that version outside, it lost a little bit of its luster and the crowd sort of stopped paying attention. I decided, to show you how great this alma mater is, let’s put it up in a higher key, let’s surround the alma mater itself with fanfare elements and really try to make this thing sing. HOST: Using Finale – an industry standard program for creating music arrangements – Dr. Espinosa went to work. RICK: The song has a chord structure that’s very straightforward. The key here is I needed to add some secondary elements to it. It’s tough to demonstrate with this program because it wants to punch each note. What I tell the ensemble is to sing this out …. HOST: It needs more of a flow to it. RICK: Absolutely, play through that. One of the elements I’ve discovered in teaching music this past decade is to make music work well, you have to marry two aspects of it. If we just categorize music into one of two categories, you have song, and you have dance. And if you can marry the two, then you’ve got an effective composition. HOST: The original arrangement created by the Joplin Junior College students is deceptively simple, says Espinosa. Trying to create chord structures around it can be tricky. As an arranger, every time I get here I get kinda stumped. It seems pretty straightforward, here’s the second line, shaping and guiding, and then where do I go? I get to decide each time where I’m going to go with this. In terms of chord structure, I enjoyed this aspect of the alma mater. When I got there, I was stumped. I didn’t know what to do. It took some creative license to figure that out. In fact, our director of choral activities told me as well, when you figure out what that chord is, please let me know. Because I need to figure that out myself. HOST: The end result is that the new version of the Alma Mater offers a mix of bold fanfare and sentiment, leading to a big finish that still sounds traditional as the band, as Espinosa says, “brings this puppy back home.” When finished, he met with Missouri Southern President Dr. Alan Marble and other university administrators to showcase the new arrangement. Thankfully, after we demonstrated it, there was no need to confer privately, I simply got the thumbs up and he said alright you go ahead and perform this. It was a big relief to me because it’s always nerve wracking when you mess with something like this, but I did fully believe what I was doing was for the betterment of the university. HOST: The complex arrangement Dr. Espinosa built around Missouri Southern’s Alma Mater certainly adds a new dimension to the piece, but at its core are those four lines of music written by that group of Joplin Junior College students. As the years roll by, their names will still be remembered for establishing one of our most important traditions, whether in books celebrating our history or just simply credited in commencement programs. LEE: It really is neat, and I think that’s important to tie in with our Missouri Southern family, to see those people who sat around a table, came up with the words, plinked out the music on a piano and gave us what we now know as our Alma Mater. HOST: And that’s it for the first episode of MOSOunds. We’ll be back next month to tie in with the Korea Semester – which will be celebrated at Missouri Southern throughout the Fall. Thanks for listening.